The ocean and air remain warm with sunshine and dry weather across the region. As a result, Puget Sound is a lot warmer going into the new year. Hood Canal is responding with temperatures warmer than previous measurements, breaking its low temperature stint. First signs of growing phytoplankton are coloring the water green. Patches of jellyfish are overwintering in finger inlets of South Sound. Tidal fronts and suspended sediment are visible amidst the stunning San Juan Islands scenery. A sediment-rich water mass is trapped in Rosario Strait. Check out the South Sound Estuarium and the many reasons we love Puget Sound! Description The ocean and air remain warm with sunshine and dry weather across the region. As a result, Puget Sound is a lot warmer going into the new year. Hood Canal is responding with temperatures warmer than previous measurements, breaking its low temperature stint. First signs of growing phytoplankton are coloring the water green. 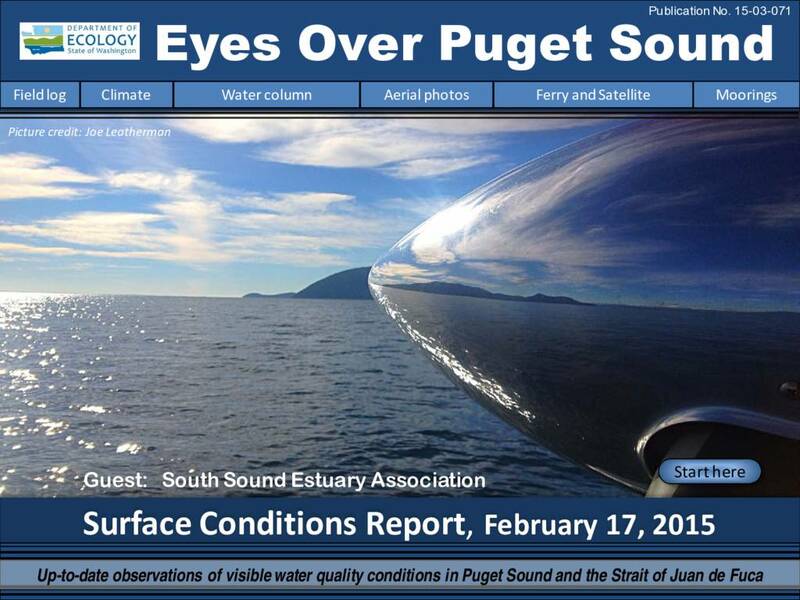 Patches of jellyfish are overwintering in finger inlets of South Sound. Tidal fronts and suspended sediment are visible amidst the stunning San Juan Islands scenery. A sediment-rich water mass is trapped in Rosario Strait. Check out the South Sound Estuarium and the many reasons we love Puget Sound!